At Fuller’s Kitchen, we take taste personally. While Fuller’s is recognised for the craftsmanship and heritage behind our range of award-winning beers, the same can’t be said for our amazing food. Simply put, people just aren’t how much care and passion goes into every dish that leaves the kitchen when they dine at a Fuller’s pub. Some even say they’ve never even heard about Fuller’s food. In Fuller’s pubs, our chefs are trained to create quality dishes, using only the finest, freshest ingredients. It’s part of Fuller’s dedication to premium service and standards. In fact, our ingredients aren’t just fresh, they’re today’s. They’re always seasonal, and often local. We know the names of the farmers who provide everything from steak to celeriac. We even know the name of the Captain - and the number of the boat - that caught every fish. The menu in a Fuller’s Kitchen pub is as individual as the Chef who creates it. It’s signed by the Head Chef, as a mark of personal pride in the dishes available from their kitchen. So we’re letting them do the talking. Our chefs show passion for every dish. They demand fresh ingredients. They have the ambition to create exceptional flavour. And the experience doesn’t end when you leave the pub. You can follow Fuller’s Kitchen on Instagram, Facebook and Twitter, for mouth-watering glimpses of the latest signature dishes, fresh from the pass. So what is Fuller’s Kitchen? 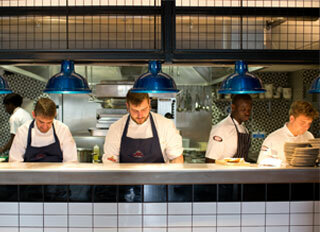 It’s the people who practice their craft in it, with skills passed from Head chef to Sous chef to Commis Chef. They are the best ambassadors for our food. It’s their voice, their passion, their belief in their art, coming from the heat of the moment and displaying the passion and attention that goes into every dish. Fuller’s Kitchen is about culinary authenticity. It’s the same heart and heritage that goes into our beer. From the people who know their kitchens better than we know the brewery.